The Whitnash Windmill Pétanque Club started in June 2005, and moved its home ground and its membership from the Leamington Football Club to the Whitnash Sports & Social Club in October 2007, when our Pétanque members physically and financially converted a piece of derelict land at the club into the fantastic facility that it is today. Pétanque (or French boules as it is sometimes known) is a sport for all ages and abilities and men and women compete with and against each other on equal terms. It provides a good form of exercise and is an excellent way of socialising, which is very beneficial to all members, young and old. 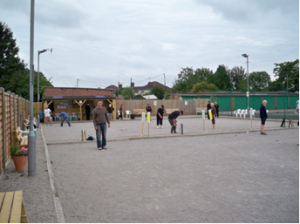 Members can use the Pétanque Section purely as a hobby or social activity, but many members frequently represent the Club in Regional and National events. It is rumoured that by the 2024 Olympics, pétanque will have become an Olympic sport, and its popularity is growing all the time. Since becoming part of the Whitnash Sports & Social Club, the Section has developed a fantastic, purpose-built, floodlit terrain which is the envy of Pétanque Clubs around the country, and we are proud to have been invited to host national EPA (English Pétanque Association) competitions at our venue on several occasions. We have earned the reputation of a very welcoming, friendly, well-organised club, with excellent Pétanque facilties. The Pétanque Section of the club continually maintains and enhances the facilities of our Club, and we have a keen and pro-active committee running the section. We hold many competitions throughout the year, some competitive and some social, and also two very successful open competitions which always attract some of the best players in the country. We hold our Club night on Mondays, every week of the year, thus providing continuous activities for our members all year round. Everyone is welcome to come along any Monday evening to try it out to see if this is for you. Equipment can be provided, and you are allowed three free sessions before committing to joining the club, so you have nothing to lose – come along and give it a go – just be there by 7pm for a 7.15pm start any Monday night. Anyone from 10 to 100 can play pétanque and the basics can be learned in half an hour. It can be an individual pastime, a family activity, or can be a serious sport if desired. A friendly welcome awaits you all.